Looking to host 20 to 300 Guests? We are here to help. Whether it is your own exclusive area for large groups or intimate space for smaller groups. 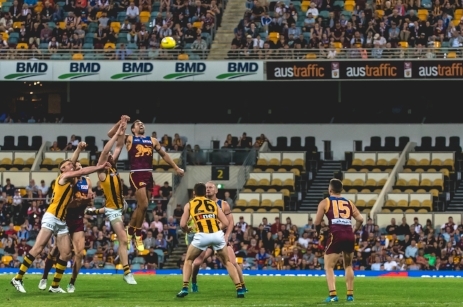 Entertain your guests with a unique experience in your very own private room or group seating while immersing yourself within the atmosphere of live AFL at the Gabba. This historic sporting stadium is the ideal venue for mixing business with pleasure and would suit entertaining staff, corporate gatherings, sporting clubs, friends, community and school groups. We have a range of options available throughout all locations of the stadium and our corporate team would welcome the opportunity to assist in creating a seamless experience for you and your guests. Entertain your group at a home game of your choice. Ideal for sporting clubs, staff, corporate events, friends, community and school groups. Enjoy great entertainment and big savings from one of our dedicated group locations. This historic sporting stadium is the ideal venue for mixing business with pleasure from cocktail functions, private dinners, business conferences and unique events for up to 300 guests.